shark teeth and the other fish, reptile, and mammal remains from this site. 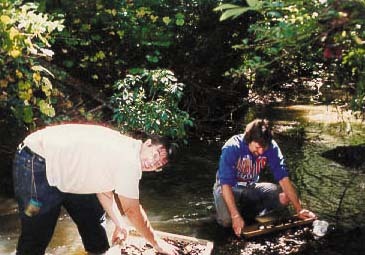 screening the gravel for fossils. Very Common - You can expect to find multiples of these fossils on an average trip. Common - You can expect to find one or two of these fossils on an average trip. Less Common - You can expect to find one of these fossils in a few average trips. Uncommon - You can expect to find one or two of these fossils in a year of average trips. Rare - Only one to a handful of these fossils has been found. To view the picture full size click on the image. picture load. Then you can toggle back and forth between pictures by running the mouse over them. All specimens are in the collections of the author, except where noted. I used a US Dime to show scale. It is 11/16 in or 18 mm in diameter. Having trouble identifying material from Shark River? the New Jersey State Museum, Carl Manning from the AMNH, Diana Tasco for typing.